WASHINGTON — Former Vice President Al Gore said Monday that he had a “productive” meeting with President-elect Donald Trump. He also dubbed it “an extremely interesting conversation” but when asked what was discussed he only said “to be continued” before leaving. Gore said he also met with Ivanka Trump, the president-elect’s daughter. 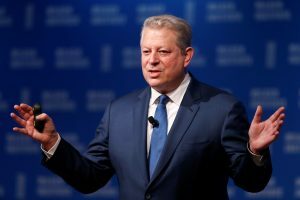 Transition officials said earlier Monday that the two would discuss climate change, which is Gore’s signature issue. The president-elect called man-made climate change a hoax and has pledged to undo a number of regulations to protect the environment.